San Antonio furnace installation is our specialty. Whether you require replacement of an existing heating system or installation of a system in a new or remodeled home, we’ll help you find a solution that is efficient and cost-effective. Air Experts will perform a thorough analysis of your home heating system and diagnose problems (e.g., certain rooms being too hot/cold, leaky ductwork, etc.). We’ll also discuss your current heating costs and see where you can save. Needing a new heating system installation in San Antonio does not have to be a stressful experience. Contact Air Experts today and find out why our customers call us the best heating installation company in San Antonio! When facing an install, it’s important to get everything right from the start to avoid unnecessary repairs. Air Experts has years of experience installing new furnaces in San Antonio and we don’t leave until your heating equipment is working properly and efficiently. Don’t get left out in the cold with a brand new furnace. Call Air Experts and make sure your furnace install is done right the first time. 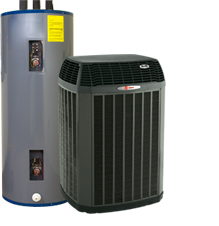 We recommend Trane Heating & Air Conditioning equipment to our customers. Trane is known for its outstanding reliability and consistent high ratings by product-testing magazines. Yet, if you have experience with another brand (e.g., Carrier, York, or Ruud) and would prefer that equipment installed, we can do that too! There is no system we haven’t worked with before and can ensure proper heating system installs no matter what make or model. Your new heating system will be installed by professional factory-authorized technicians who are EPA certified, fully licensed and insured, and trained on an ongoing basis in the latest heater/furnace installation techniques. Your technician will arrive with a fully-equipped service truck, guaranteeing that the job is done in a timely manner. Contact us today to learn more or schedule an appointment for a heating system installation.